Cookies are one of the most difficult things to lighten up. They need butter or else they take on a cakey texture. 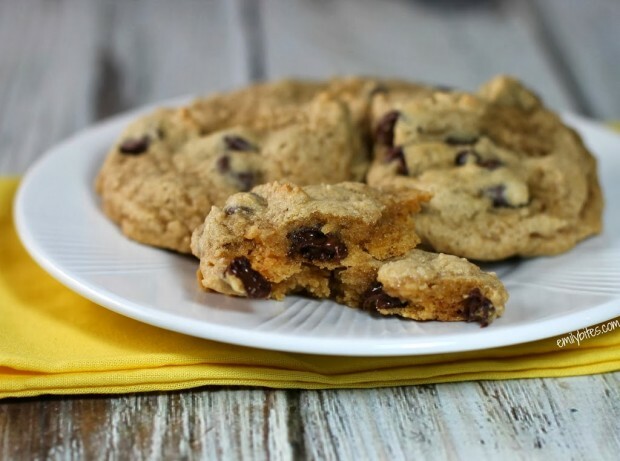 Now, I don’t have anything against “cakies,” but sometimes you just want a real, authentic cookie: crispy around the edges and soft in the middle with gooey pockets of chocolate scattered throughout. Yum. 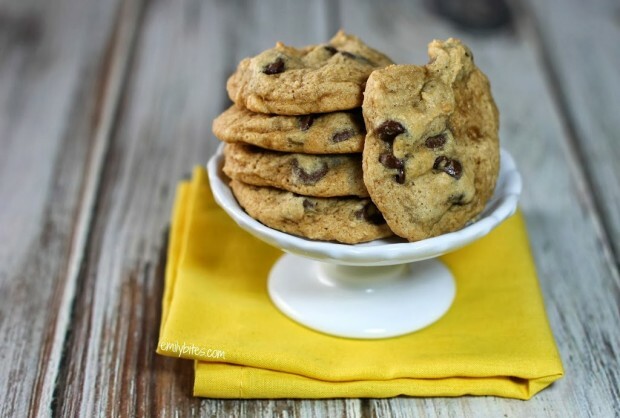 My fiancé actually makes the original version of these Chocolate Chip Cookies all the time (though he doubles the recipe and the chocolate chips and still has it make 24 cookies, so his are huge), and since they always turn out delicious I wanted to take a stab at making them a little lighter. 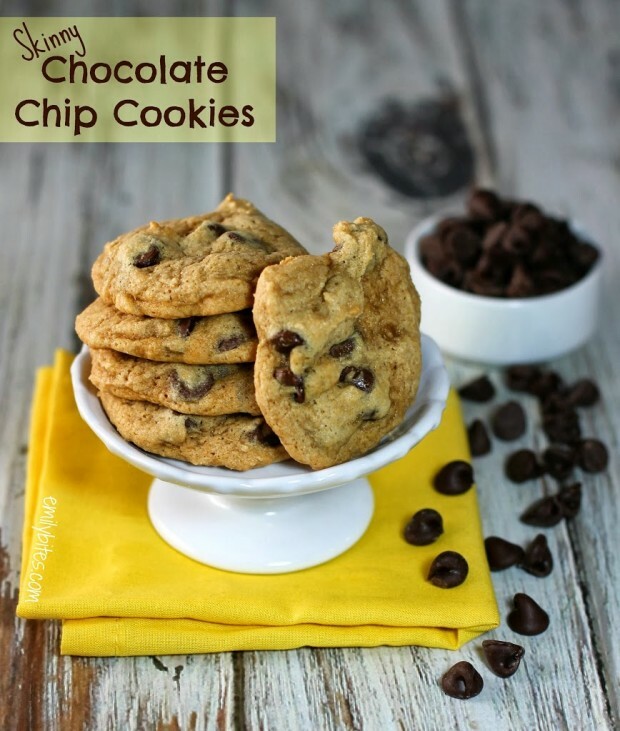 I think they turned out great – perfect cookie texture and warm gooey chocolate. This recipe can easily be doubled or halved, so make as many as you need. Chocolate Chip Cookies also hold up well in the freezer so if you worry that you’ll end up gobbling up all 24 at once, freeze some for later! Preheat the oven to 350 degrees. Line a baking sheet (or two) with parchment paper (or set aside an ungreased baking sheet). In a mixing bowl, combine the butter, brown sugar and white sugar and cream together using an electric mixer until well combined. Add the vanilla, egg white and water and stir to combine. In a separate bowl, stir together the flour, baking soda and salt. Add the dry mixture to the wet one and stir until fully combined. Fold in the chocolate chips. Drop 24 rounded tablespoons onto the reserved baking sheets (12 cookies per standard baking sheet, so either use two or make two batches) and bake for 8-12 minutes. When cookies are done, transfer to a cooling rack. You say to add cream… But unless I’m missing it I don’t see cream listed? I think she means “to cream together” the butter and sugars with a mixer; not cream as in an ingredient. Yum!! I made these as soon as I saw the post! I used one of those little scoop things to put the cookie dough on the cookie sheets and was able to get 29. Well, I’m guess I could have gotten THIRTY if I hadn’t sampled the dough a little. Even the hubs liked it!! I just finished making these and they are delicious!! I used white whole wheat pastry flour instead of regular white whole wheat flour, though. I’m not sure how much it changed the texture or flavor, but I will definitely be making them again. My husband, who LOVES chocolate chip cookies, couldn’t tell they weren’t my regular recipe. I’m so glad you and your husband both loved these – what a great compliment! Made them with the creamy chicken and rice soup tonight and both were awesome! A very tasty and healthy meal! Ooh, good pairing. So glad to hear they were both hits! Looks delicious! I’ve been searching for a good CCC recipe for the past few days. I should have known to come here! I always joke to my friends that you’re my sister from another “mister” because your recipes always coincide with my taste buds! Plus you make everything so easy! Thanks so much! Taste bud twins!! 🙂 I hope you love these too! I live in Canada and have not been able to find any “light” butter. The only thing we seem to have is light margarine or one product called “I Can’t Believe It’s Not Butter” which is pretty much a margarine. Would this work do you think? I too live in Canada (ON to be exact). I found a light, whipped, spreadable butter at the Superstore that would likely work for this recipe. I forget the brand but it’s in a small rectangular container with a blue lid (beside is the full fat product with a red lid). I want to say it’s made by GayLea. Haley Tilling (or anyone else too!) – I looked on Gay Lea’s website and it looks like the Light Spreadable butter with the blue lid is indeed the one you’re talking about. Have you found it anywhere besides a Superstore though? I don’t have one very close to me in Dundas, Ontario and was hoping to get it a little closer to me. These were quite tasty. I would have liked them to be a little more crispy around the edges though.. Do they get more crispy as they cool? Cookies are one of the hardest things to lighten up for this reason! Butter is what makes cookies crispy so using less butter = less crispy cookies. I’m glad you liked them though! These cookies worked out really well but I did change it up a little. Instead of all that butter I used 7tbs of coconut oil. I also tried it with adding banana and tried another one with adding some penut butter and they both tasted great! I definitely recommend trying it! I tried these but for some reason they did not spread out. They just stayed in a ball What do you think I did wrong?